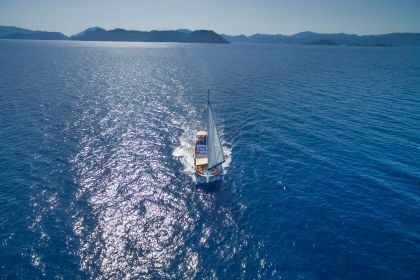 Chartering a private yacht is essential for exploring the 12 islands near Gocek, an unrivalled yachting destination on theTurkish Turquoise Coast. Located between Fethiye and Bodrum, Gocek is a small town on the Lycian coast that serves as the heartbeat of Turkey’s yachting industry. With six top-notch marinas, the 12 islands of Gocek create a natural harbour offering protection from the wind. Uncrowded and exclusive, Gocek attracts the likes of Roman Abramovich, Bruce Willis, Prince Charles and several other high-profile celebrities. With plentiful dive sites, moorings and sea life, luxuries abound in Gocek. The charming town is known for its warm and friendly atmosphere, a favourite resting place for the upper echelons. It offers an escape into unspoilt nature while also brimming with excellent facilities, making it an essential stop for seafarers. As you cruise into the port aboard your luxury superyacht, you’ll be able to admire the single-story buildings (development is restricted here) and azure waters of this gem on the Turquoise Coast. A relaxing alternative to Fethiye, Gocek is the perfect addition to your Turkish Riviera yacht charter itinerary. Skopea Limani is the enclosed gulf that lies seven miles south-west of Göcek, the perfect place for cruising. Explore its numerous sheltered coves and islands; some particularly special places to drop anchor include Wall Bay and Tersane Creek. Spend your days exploring the famed 12 Islands, each with its own remarkable beauty, hidden beaches and verdant landscapes. Tersane Island features the partially submerged ruins of a Byzantine monastery and an ancient boat-yard. On the northern side of the island you’ll find a restaurant where many yachties go to fill up on authentic Turkish food. Kargi Bay is another unmissable spot, great for swimming, diving and surfing. Turkey’s most famous beach, Olu Deniz (Ölüdeniz) Lagoon - also known as the Blue Lagoon – is the perfect place to spend a day or afternoon while moored in Gocek. As you approach the bay you’ll be awestruck by the impossibly blue water of the lagoon, rimmed by a white sand beach and pine forests. Spend the day swimming and sunbathing, or up the ante and paraglide off the peak of Mt. Baba (Babadağ). The shallow, calm water is perfect for younger charter guests. While there’s nothing better than dining al fresco on the deck of your luxury yacht, gourmands will be tempted to see what Gocek town has to offer. For a relaxed yet sophisticated experience, try West Cafe & Bistro. With a prime location overlooking the harbour, the top-quality bistro is the perfect place for a cup of Turkish tea. It’s also worth visiting the attached olive oil boutique. For more of a fine dining experience, plump for Daidala Restaurant, specialising in seafood and Mediterranean cuisine. Indulge in Turkish mezze and chargrilled octopus while listening to the nightly live music. Beyaz Yunus in nearby Olu Deniz is the premier destination for gourmet waterfront dining. With a romantic terrace overlooking the sea, the rich menu of traditional Turkish and Greek favourites will please even the most discerning diners. Gocek has a quieter nightlife than other Turkish Riviera destinations, however Olu Deniz has a buzzing atmosphere at night. D-Resort Gocek is an upscale resort with a private sandy beach, a superb spa and several bars. For a relaxed yet atmospheric evening, order a cocktail or two at the hotel’s Q Lounge and toast to beautiful Gocek, while marvelling at the view of the bay. Lime Beach Bar at Club Marina is an impeccable spot to take in the spirit of Gocek after the sun goes down. Chill out in a private cabana while gazing out at the sparkling blue sea. There’s plenty for the kids to do too, including a trampoline floating in the sea. 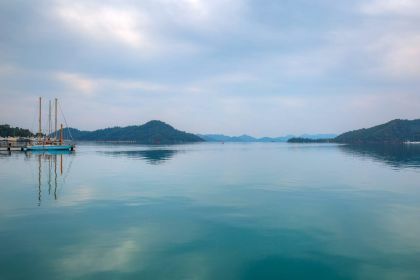 The calm, protected waters of Gocek are perfect for kids to paddle and snorkel in. Many resorts in the area have playgrounds and activities for children, and the Turkish Riviera as a whole is very child-friendly. The 12 Islands offer plenty for children to do, from exploring hidden caves and secret beaches to snorkelling near underwater ruins. The sea here is teeming with marine life, and kids might be able to spot loggerhead sea turtles and maybe even dolphins. 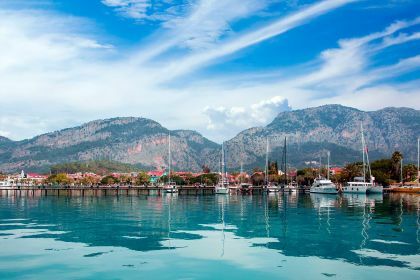 For a day away from your private yacht, take the children to Olu Deniz Waterworld, complete with nine slides, a wave pool and a children’s club. 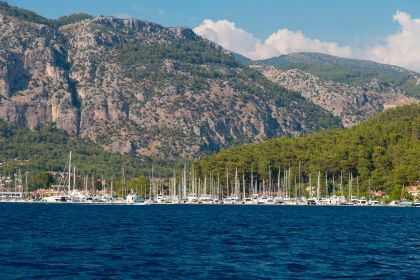 With so many protected anchorages in the immediate Gocek area, you’ll enjoy fantastic sailing conditions even if you choose to charter a little earlier or later in the season. You’ll be spoilt for choice with gorgeous anchorages nearby such as Four Fathom Bay, Ruin Bay, Wall Bay and Tomb Bay. 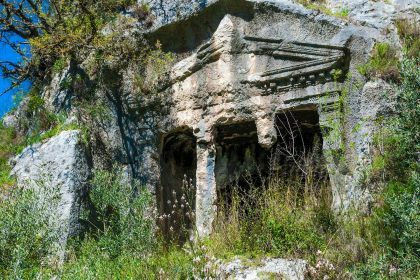 These are all within easy reach and the historic Lycian Coast is yours to explore. Chartering a luxury motorboat with all the top-drawer amenities is an easy task with our yacht charter broker at hand. Whether you’re chartering a luxury catamaran, sailboat or large superyacht, we’ll ensure that you have all the luxury amenities needed for your yacht charter vacation in the Turkish Riviera. Drop us a line here or give us a call for a truly memorable sailing experience in Gocek.